Shamrock V. Designed by W. Starling Burgess; built by Herreshoff, Briston, RI. Owner: W. W. Aldrich & sundicate. 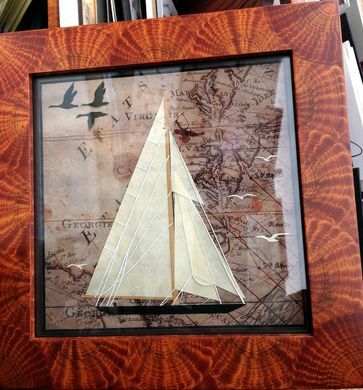 I hand cut sails from rice paper, rigging hand cut from 1865 antique ledger paper. Hull cut from Silhouette paper and Color Aid papers. Sea birds cut from Rice Paper & Silhouette paper. Background created from my antique maps and nautical charts.